i Click 'view all' to instantly compare this good deal with offers on other top alarm clocks. 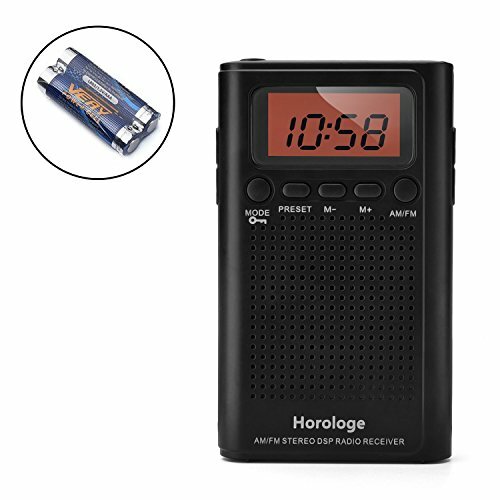 Horologe AM FM Pocket Radio Portable Alarm Clock Radio is currently selling at $15.99, approximately $0.04 lower than average, giving a potential saving of $14.00 right now. With a lowest price of $15.99 and an average of $16.03 it is selling on the low end of its usual range. Price volatility is 0.89% (meaning it does not change often), so the price should stay low for a while. Right now this product is a recommended 'good deal'. The current deal is also the best price on this item over the last month. 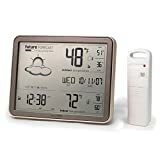 Compare the current price, savings (in dollars & percent) and Buy Ratings for the top Alarm Clocks that are closely related to Horologe AM FM Pocket Radio Portable Alarm Clock Radio. Here is how Horologe AM FM Pocket Radio Portable Alarm Clock Radio compares with other leading Alarm Clocks. The Horologe AM FM Alarm Clock Radio packs a powerful punch of sound in a convenient handheld device. Tune in to your favorite sports talk show or game broadcast, NPR, news program or your favorite local station music wherever you want to listen to it. When connect to the 3.5mm earphone jack, you can choose the stereo mode for a more comfortable sound. Battery-operated convenience and full stereo sound with Dynamic Bass provide an enjoyable listening experience anywhere, anytime. Features of the AM/FM radio -Band AM FM radio, easily into shirt or jacket pocket. -Built-in clear sound speaker and 3.5mm earphone jack -Slim and portable, attached a carrying strap for convenience -With a LCD screen to display time, frequency, alarm and mode you set or choose Power by 2*AAA battery(included), you can also supply power by a DC 3V adapter (not included) . Specifications Product dimension: 3.9*2.4*0.6 Inch Power supply: 2 AAA batteries or DC 3V Frequency range:AM:520-1710KHz FM:87.5-108MHz S/N Sensitivity: FM: better than 6?V AM: better than 3mV/m SNR: FM SNR: better than 50dB AM SNR: better than 40dB Radio: 1*Pocket Radio 2*AAA Batteries Features?Rich Features. Digital LCD screen, built in AM/FM radio, time display and alarm. Powered by 2*AAA batteries (included) or a DC 3V adapter (not included). When listen to the radio with earphone(not included), "stereo mode" will let you get a higher quality sound. ?Excellent Reception. Use an advanced DSP chip as the radio brain, making the signal analysis and reception ability stronger and channels more stable. ?Easy Operation. Simple and well-designed operation program, succinct and clear buttons and function indication, the elderly or children also can use it easily. ?Super Portable. With a 3.9"2.4*0.6 inch body, small and slim. You can put it into your pocket, handbag, backpack or shopping bag easily. Here is a "lock" to help you to prevent misoperation so that your set is saved safely. It is really a good choice for outdoors, travel, sports and home.